We have a V.I.P. night planned for you! At Teacher Appreciation Night, learn about Birch Aquarium’s classes, field trip programs, and how to maximize your class visit to Birch Aquarium with a night for educators only. Pre-K to Grade 12 teachers only. 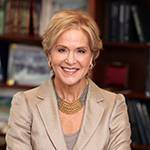 Join us for a conversation with Judith Rodin, former president of the Rockefeller Foundation and Steve Clemons, editor-at-large at The Atlantic.